Following World War II, the Japanese cities of Hiroshima and Nagasaki literally needed to be rebuilt from the ground up, and the numerous residences of those two cities would have required the growth of 150 years worth of timber for reconstruction. With the obvious impracticality of this situation, Japanese builders turned to metal frame houses as an alternative, and quickly discovered that various metal sheets were ideal building materials. In addition, the metal materials were found to be fireproof, and methods were developed to form light-gauge steel into lumber sizes and shapes, which helped to make steel buildings popular all around the world. From that time to the present, many countries have adopted metal frame building construction, and have discovered the advantages offered by them. In America, metal buildings are one of the structures likely to be built in great numbers after the devastating floods of May and June 2015. News reports chronicled the fact that enough rain fell on the state of Texas during this brief period to cover the entire state eight inches deep in water. With this spectacular devastation in mind, the desire to avoid future flooding calamities to residences is uppermost in the minds of homeowners across the state as well as the country, and this should naturally lead them to embrace metal frame buildings as a very attractive solution. 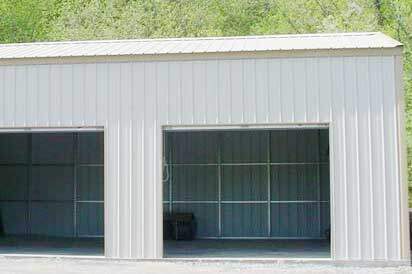 There are several very good reasons for the usefulness of metal buildings in areas where flooding and high rates of moisture can be anticipated. The problems that mold can cause in a household are well known, especially with agencies like the U.S. Center for Disease Control and Prevention alerting the public to potential dangers. In homes having a significant amount of moisture, like a persistently humid one or in a home recently flooded, the potential for mold growth increases dramatically. If mold is allowed to take hold in a home, it can lead to asthma, infections, hypersensitive pneumonitis, respiratory tract infections, coughing, wheezing, and irritations of the nose and throat. Since metal buildings do not contain wooden studs where mold thrives, a major host for mold is eliminated. Roofing is another area where metal sheets excel – they contain no shingles or shakes which might crack and allow moisture to seep in and promote the growth of mold, so they are relatively immune from roof damage as well. Some metals do break down in the face of oxygen and excess moisture, but the materials used in building good metal frame homes resist that kind of breakdown very well. Galvanized steel and Cor-Ten steel both are highly resistant to corrosion. In the case of galvanized steel, its zinc coating shields it effectively from exposure to moisture and the elements. Cor-Ten steel includes a metal alloy comprised of copper, chromium, manganese, and nickel, and together these provide a solid barrier to any harmful effects of weathering. This means that in flooding scenarios, both these building types would be ideal for resisting natural corrosion from the high prevalence of moisture. Wooden homes when flooded become saturated with moisture, and the structural damage to framing and panels becomes very significant. Over even a brief period, this will lead to rotting and all the wood will have to be replaced. Since metal sheets lack the porosity of wood, they do not absorb moisture and they do not weaken or rot. In addition, metal sheets do not warp, shrink, or get twisted out of shape as wooden panels often do. The method used to apply paint to a metal sheet causes it to last for virtually the same period as the metal sheet itself, which for all intents and purposes, is a lifetime. Because water seeps into wooden panels, below the surface where paint has been applied, it warps and rots the wood underneath, which in turn severely damages the surface paint. Since there is no seepage or absorption in metal sheets, the under layers are unharmed and the surface layer of paint remains undisturbed. Whereas a wooden home would need to have wood replaced and re-painted, a metal home requires neither of those. When floodwaters finally recede from a stricken community, the real work of rebuilding can begin. If that entire community was built using lumber, the reconstruction process is likely to be a very long and tedious period, because so much rebuilding will be necessary. By contrast, a community of metal homes can be restored far more quickly – in most cases, all that might be necessary is the replacement of drywall, any carpeting that was affected, and perhaps some furniture or cabinetry on lower floors. A factor not to be overlooked in reconstruction is the long, drawn-out nature of rebuilding a community of wooden homes. For all the time that rebuilding is ongoing, a kind of depression hangs over the area and people are constantly reminded of the catastrophe which has befallen them. A much quicker return to normalcy is possible by rebuilding with metal frame homes, and restoring the community to the vitality it enjoyed prior to the flooding. Before any possibility of flooding, a homeowner should take care to build a home on a concrete pad elevated 18″ above the surrounding natural grade. Then when the foundation is poured, that home will be positioned above floodwaters if they come, and all serious damage will be avoided. 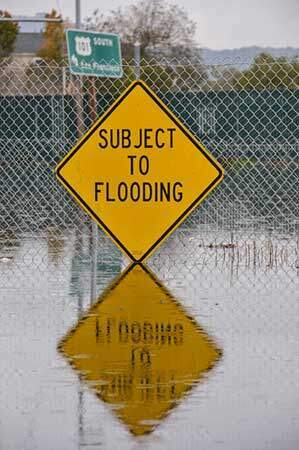 When floodwaters arrive, your metal frame building will sustain little if any damage to structural panels, because they will not absorb problem-causing moisture. Exterior paint will not be harmed, and no harmful mold will be given a foothold in the home, because moisture will drain away rather than saturate building materials and remain in place. 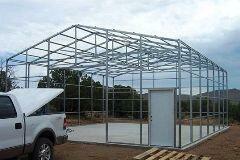 The clear building choice in areas of high flooding should be high quality, long-lasting metal buildings.